I actually got rid of my steamer a year ago because we NEVER used it anymore — the veggies just have SO much more flavor when roasted, grilled, or sautéed. 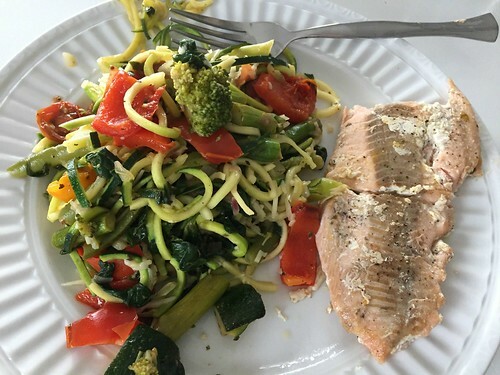 When we were first married, I shied away from roasted vegetables because I wasn’t exactly sure what I was doing (I grew up on steamed and boiled vegetables). However, after a bit of trial and error, as well as lots of different flavor combos, I feel extremely confident in my ability to roast almost any vegetable! Of course, it helps that I can simply hop on the internet and search for different ideas, recipes, seasoning combos, etc.! If you’re new to the world of roasted vegetables, I hope today’s tips will give you the nudge you need to give them a try. They are SOOOOO delicious! Tip #1: The only ingredients you need are some type of oil, salt, and pepper. Yes, you can definitely add more ingredients and get more creative with your seasonings, but the only things you really need for roasted veggies to be super yummy is some type of oil, salt, and pepper. I almost always use Extra Virgin Olive Oil, but I promise you, vegetable oil and melted butter will work just fine! You don’t need a lot — just enough to coat the veggies so they don’t burn. Side note: If you see that your veggies are getting quite brown before they are soft, you can spray them with a little cooking spray — kind of crazy, but it really works! Once the veggies are coated with oil, sprinkle them liberally with salt and pepper and pop them in the oven. There are all sorts of different seasoning combos you can try once you get the hang of roasting veggies, but to start out, just keep it simple with oil, salt, and pepper! Tip #2: You don’t need a crazy hot oven. If you look online, most recipes for roasted vegetables will tell you to preheat your oven to 400ºF – 45oºF… and if all you’re cooking in your oven is vegetables, this is fine. HOWEVER, since I’m almost always roasting vegetables while I’m cooking the rest of our dinner, I usually keep my oven temp between 350ºF and 375ºF. This means my veggies take a bit longer to soften up, but I can roast them right along side my casseroles, pasta dishes, roasts, or anything else I’m making that day. Feel free to adjust your oven temperature, just know the veggies will take a bit longer at a lower temperature — but they will taste just fine! Tip #3: Don’t worry if they get a little over-done. When it comes to steamed or boiled veggies, there really isn’t anything worse than soft, mushy broccoli and cauliflower, limp asparagus, or soggy beans. However, roasted vegetables are much more forgiving (at least in my opinion). I most definitely prefer slightly over-done roasted vegetables as I think they have even more flavor and a much better texture than under-done veggies. Depending on the temperature of your oven and how much food is in your oven, the time to cook your veggies could vary widely. I usually check mine about 10 minutes before I think they’ll be done. That gives me a rough estimate to gauge the rest of my meal by. Are the veggies still really hard and will need at least 20 more minutes? Or are they almost ready to eat? And when in doubt, leave them in the oven for a few more minutes! Tip #4: Use aluminum foil for easy cleanup. This might sound gross to some of you, but I honestly use the same baking sheets over and over and over again (without washing them) because I simply line them with aluminum foil! 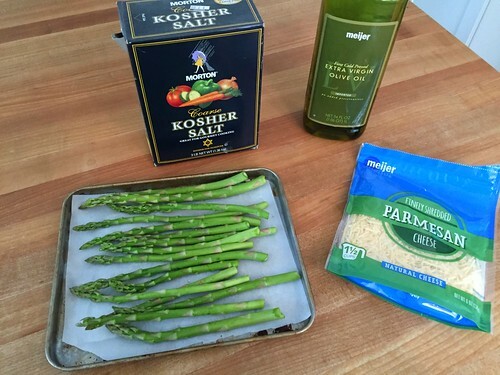 I spray the foil with cooking spray, then add the oiled veggies, and nothing sticks! At the end of the meal, I simply toss the aluminum foil and pop my pan back in the cabinet for the next night. Tip #5: Always roast more than you think you’ll want or need. Since it takes at least 30-40 minutes to roast veggies like carrots, sweet potatoes, cauliflower, etc. it’s not really something you can quick whip up when you walk in the door. I almost always roast triple the veggies I think we’ll eat for one meal. That way, we have lots of leftovers for the next day. Dave and I have always enjoyed leftovers (I know some people don’t) but we both think that roasted veggies taste fantastic as leftovers, so it’s definitely smart to roast a bunch at a time. Tip #6: Roast a variety of veggies at the same time. As you’ll notice from all of my pictures, I usually roast a bunch of different veggies all at the same time — HOWEVER, I do have to stagger the roasting times as some veggies take much longer to roast than other. I usually start out by putting bite-size chunks of sweet potatoes, carrots, and cauliflower on my baking pan first. Then, 15 minutes later, I’ll add beans, broccoli, and regular potatoes, then 15-20 minutes later, I’ll add zucchini, peppers, and asparagus. 10 minutes later, everything is finished at the same time! Obviously, you’ll need to play around with this a bit as all ovens cook and bake differently — but it won’t take long and you’ll start to realize how your oven cooks and can add your veggies to the baking sheet accordingly. Bonus tip: Don’t worry about messing up! I know none of us want to waste food — but if you think about it, the absolute worst thing that could happen if you royally mess up your veggies is a little wasted food and maybe some money spent ordering a pizza… but I’m pretty sure it won’t come to that! Pick one of your favorite veggies and do a quick internet search on how to roast them. If you need a little extra hand-holding, I’ve linked to a few recipes already shared on my blog — they’ll walk you through the process step-by-step and only roast one veggie at a time so you don’t get too overwhelmed. What are your favorite roasted veggies? How We Celebrate Valentine's Day: Frugal, Festive, Family Fun! This maybe a silly question but do you mix the veggies with oil in a bowl and then lay out on pan or do you put the veggies on a pan and pour oil on the veggies? yes, I mix them in the bowl with a little olive oil and whatever seasonings I want to use. I find I need much less oil this way since I can really mix up the veggies well and then spread them on the sheet pan. Try roasting sliced mushrooms with asparagus. Oil, salt & Pepper are all you need. The taste combination is delicious. Sometimes I roast these and put them in our risotto for a healthy and very yummy addition. yes, this is amazing! We’re actually doing asparagus and mushrooms for dinner tonight (adding it to zucchini noodles and shrimp)! I’ll have to try risotto some time too! Since I started roasting veggies I definitely eat more. Thank you!! I want to meal prep with them but I can’t stand mushy veggies. How do you reheat them so they are still good? Sorry if you’ve already answered this. I scrolled to check but didn’t see it if you did. Thanks!! yay for more veggies! Good for you! I tend to UNDER-roast my veggies so they are still fairly crisp. Then I reheat them in my cast iron skillet for a few minutes — they seems to be perfect every time! In a large saucepan combine the broth, tomatoes, thyme, and bay leaves. Bring to a boil. Stir in the roasted vegetables, reduce heat to med and simmer 5 minutes. I then use my immersion blender to create a textured soup that’s delicious. My initial thought as I was reading was that it sounded like a soggy vegetable soup BUT then you mentioned the immersion blender and my opinions completely changed — what a great idea for a creamier “textured” soup as you call it. I will definitely have to try this as I have all those roasted veggies already in the fridge, ready to go! I have been roasting veggies ever since reading this post, and I now eat far more veggies than ever before, thank you for that! I just wanted to tell you that you can easily skip the tin foil liner and/or parchment paper. The pans very easily clean up if you just soak a half inch of water in them…only takes minimal time for it to just wipe out. If you put water in there while the pan is right out of the oven, it even wipes out faster. This has been true for all my veggies, even yams. Nothing is a mess to clean up. So happy to hear you are eating more veggies this way! As for the pans, I actually purchased USA sheet pans (the biggest size I could find) and now use those without tinfoil as NOTHING sticks to them! 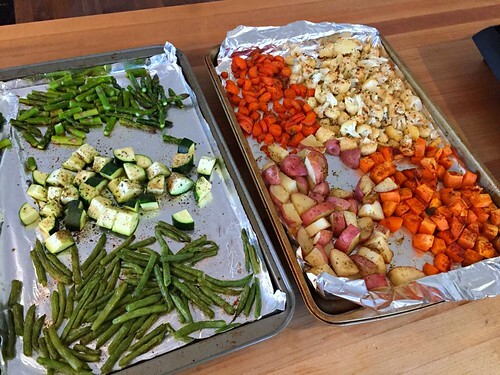 They are amazing and I’m glad I’m no longer “wasting” tinfoil for roasting veggies every week! I just ordered the USA pan. Thanks for the great tip. Even though I am long past raising my children and simplifying and organizing life, I love reading your blog…I think it’s because you remind me of me, and I like me! oh good — you’ll LOVE them! I’ve had my bread pans for years and have been using the sheet pans for about 3 weeks now. They are fantastic! Thanks so much for your kind words too — I’m thrilled you enjoy my blog! Got my USA sheet pan, and you are right, it’s fantastic! Another tip…try roasting the Aldi My Little Salad Kale mix (set aside the dressing and nuts/craisins for later)…it’s amazing. I will add the nuts and craisins afterwards. I always roast bacon too and use the fat on top of the other veggies. My favorite seasoning to use is Trader Joe’s “21 Seasoning Salut” which doesn’t add salt. 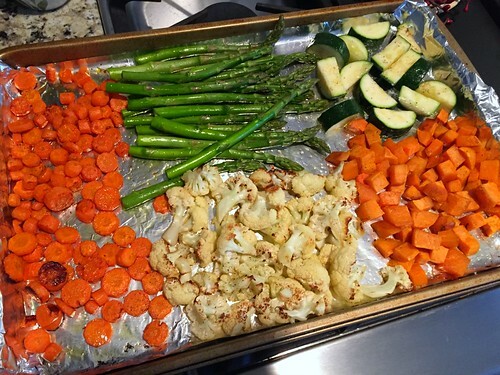 awesome — I’m roasting 2 huge trays of veggies on my pans RIGHT NOW! They smell delicious! I do roast Kale quite regularly — but I’ve never tried to the salad kids. I might have to do that — sounds yummy!! Thanks! Just wanted to share that with roasting sweet potatoes, I found a recipe of just tossing the cubed potatoes in olive oil and then coating/tossing in Lipton Onion Soup Mix powder. It’s a great savory flavor as opposed to the sweet potatoes in butter/brown sugar/cinnamon flavoring. Try it! yum!! I like a little paprika on my sweet potatoes. SO good! What I really liked with veggies is something my mom added to them mostly by mistake. I was getting ready to roast them, but there wasn’t enough time so we decided to put them on the stove top. After I seasoned them with my regulars: salt, pepper and garlic powder, mom added turmeric and cumin until all the veggies became yellow. 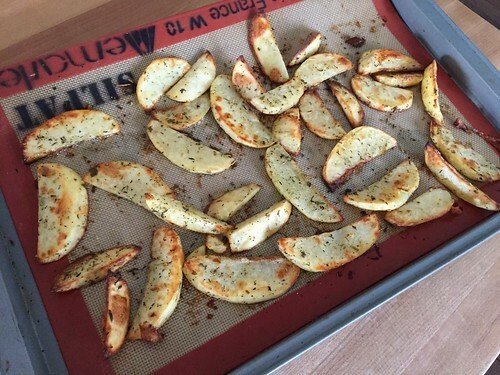 They tasted amazing….so different than my regular veggies seasoning. I also like that they were cubed rather than sliced – I usually slice them to sautee and cube them to roast, but this little change made a nice difference for me…. oh yummy — I haven’t done Eggplant yet. I wonder if we’d like it! 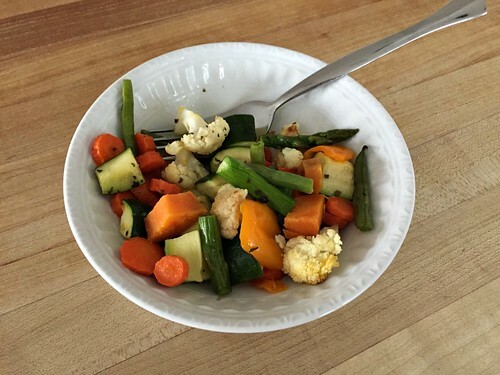 And yes, I love sautéing CUBED veggies — it does give it a different taste and texture. I’ll have to try the turmeric and cumin sometime too. Thanks for the tips! Cumin on cauliflower is one of our favorites! I just did Turmeric on cauliflower tonight — now I’ll need to try Cumin! Yes. Ours too. We fry it first and then put the lid on the pot and let it soften. Best thing….yum. I followed your tips on roasting veggies this past weekend, and they were delicious! 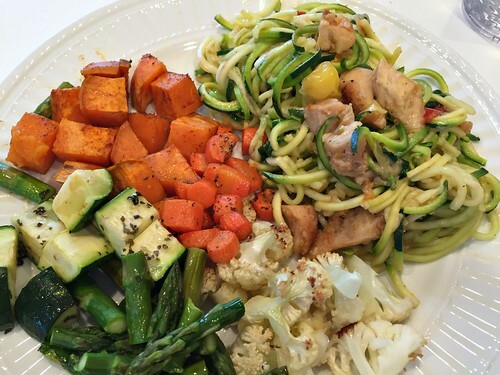 We’ve got our veggies ready to reheat for dinner or pack for lunch. It took some work to cut them all up, clean, and season, but it was worth it. I wish I had more pans though because I ended up having to transfer the cooked veggies right away so I can re-use the pan. oh good — glad you enjoyed the veggies (they really are great as leftovers too!) As with anything, it’s always the most work in the beginning — once you do it more regularly, you’ll develop a system and it won’t feel so overwhelming or time-consuming! Have you ever roasted frozen vegetables? Does it work as well or taste as good as fresh veggies? I haven’t… I have a feeling they should work though. Give a few a try and see if you like the taste and texture. If so, roast more! I’ve roasted frozen beans, broccoli and Brussels sprouts and all have worked well. The broccoli and sprouts don’t get quite as nice of a “char” as fresh, but the taste is similar. I don’t thaw or anything, just put them right on my baking sheet. You might need to add a little extra cooking time. good to know — thanks for sharing! and if your veggies end up really overdone or way too many (been there) you can always turn them into an amazing vegetable soup (done that) that will be a lot more flavoured or into a vegetable/marinara pasta sauce (also done that). I just pourred them, added tomato sauce, some basil and 10min later done! yes — good tips! Thanks Calliope! I roast all my veggies. Yesterday we had cauliflower and tonight we had potatoes. I set my phone timer for 8-minute increments and flip/stir them each time, until they are fork tender. I agree, a little bit overdone is better! The crispy brown edges make them extra delish! I was raised on steamed veggies but roasted are SO much tastier. If your method works for you, that’s great… however, I’ll let you know that I never stir my veggies or do anything with them for the entire time they are in the oven and they still come out delicious and “fork tender”. I am so glad to read this! I hate trying to remember which ones I have flipped and which ones I have not. I am going to try not flipping mine next time and see if my husband notices. I have not read through all the comments yet, but have you tried chopping your veggies early (like during afternoon nap time) and then roasting them right before dinner? I am going to give it a try. yes, definitely try not flipping them. I guess I should clarify, I DO usually flip my potato wedges after about 20 minutes… however, everything else just roasts for the full time and it always comes out perfectly for me. I just realized I didn’t answer your question about cutting the veggies ahead of time. YES! I do this all the time — I put them on the baking sheets with oil and seasonings, then cover with plastic wrap and let them sit on the counter (because my pans are too big for the fridge). 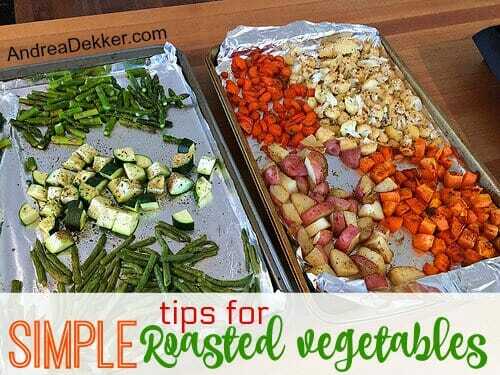 Alternatively, I often actually roast the veggies earlier in the day and just reheat them at dinner time (either in the microwave, in the oven, or on the stovetop — depending on whatever else I’m cooking for dinner). I just finished roasting 2 pans of veggies for tonight (and leftover tomorrow) so that might be a time-saving option too! Roasted Cauliflower!! Olive oil, thyme, salt and red pepper flakes–I never knew cauliflower could be so good. We also do green beans with olive oil and then shredded parm for the last 5 min to make it gold and crunchy. My kids love them both! roasted cauliflower is definitely my favorite roasted vegetable! How do you reheat your veggies for leftovers? In the oven again or microwave? sometimes I microwave them, sometimes I put them in the oven (if we already have other things in the oven) but most of the time, I “fry” them in a pan on the stove for just a few minutes. They usually have enough oil left on them that I don’t need to add more — they taste really fresh this way! Roasted veggies are great additions to salads, too. Also, if you toss roasted green beans and red peppers with some sliced cherry tomatoes and a little more olive oil and lemon juice, it’s a great side dish! yes, I often add leftovers to salads the next day for lunches! I roast romaine hearts lettuce. I cut the head in half lengthwise, oil and pepper,(no salt), each half and roast for 15 minutes. After removing the lettuce halves from the oven I sprinkle each with Parmesan cheese, top with other veggies and vinaigrette dressing for a warm and delicious salad. Whaaaaat?!?! I’ve never heard of this but I adore romaine. I’m definitely trying this!! That’s what I was thinking too Amy! I will DEFINITELY be trying this! Do you have any tips for getting the silpat baking mats really clean? I usually just wash mine in hot soapy water but they always seem to be a little greasy after using them for this type of thing. I think Silpats feel that way because of the material…that’s why nothing sticks to them. I think they are supposed to be slippery. Also, I almost always use parchment paper or aluminum foil for the veggies (just because they are oily). I save the Silpat mats for baking. I like to put parchment paper on top of the foil because I don’t like cooking directly on aluminum. But the real reason I commented… sometimes I’ll make a batch of bacon at breakfast and then save the pan for dinner time and roast the veggies in the bacon fat! So good! That is genius! I have a pan with bacon grease from this morning! Ha! Now w I’m going to roast my Brussels sprouts in that! You are so smart! Yum! Brussels sprouts with bacon are the best! good to know about the aluminum — so my question is, why not JUST use parchment paper and skip the aluminum all together? Do you feel like it helps them cook better? Because if I use just parchment, I have to wash the pan afterwards, but if I line it well with foil first, I don’t. 😉 I do think the parchment helps them cook more evenly! But also I’ve noticed in friends’ ovens that aren’t as hot, everything takes longer to cook. ah — I see. Good reasoning! I learned a great trick with roasting veggies from fine cooking magazine. Use parchment paper instead of aluminum foil, and cover the veggies with aluminum foil for half the time you are cooking them for a bit of a steaming effect. So for example, I do sweet potatoes for 30min at 400 degrees.I cover them with foil for 15 and then take the foil off and cook them uncovered for 15 more. We love roasted veggies!!! My aunt made roasted breaded zucchini(flour, milk, breadcrumbs…I think…I was pregnant and not paying too much attention being busy with the rest of the meal) when she visited one time. Oh, my! It was so good! Thanks for sharing your tip!